Who would ever think that wedding gift theft could be a thing?! If we were to go by Bollywood movies like, Oye Lucky! Lucky Oye!, Dolly Ki Doli and Wedding Crashers, we'd say YES, it happens! And why not, for those who are looking to indulge in a little "haath ki safai", your wedding is as good a place as any other. Crowded - check. Lots of presents - check. Unaccounted for - check. No safegaurds - Check = Easy to flick a few things and make a smooth exit. So, what can you do to prevent wedding crashers from making away with your wedding gifts and ruining your mood? Read on! 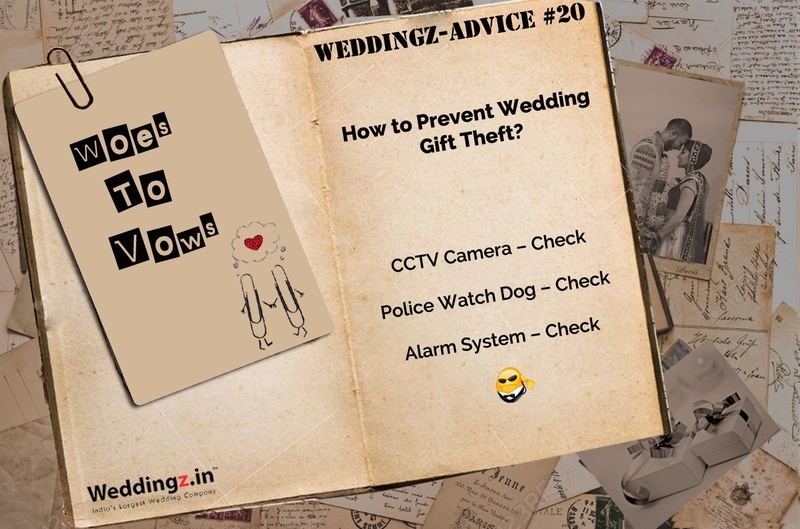 Now I know it's a bit too much if we say, ditch the idea of a big fat Indian wedding to avoid your wedding gifts from being stolen, but we are saying it. Big fat wedding, usually means bigger crowds which then equals to tons of riff-raff entry without being noticed. That's a theft alarm, right? Smaller weddings usually means close friends and family in an intimate setting where chances of randoms breaking in to your wedding are next to nothing. If your guest list is a bit larger than life and a big fat Indian wedding is on your mind, then ensure you make a personal visit to your wedding venue before the main event. This way you will have a clear idea of what goes where, including your precious wedding gifts table. Also, ask your venue manager if at all there are any security options, like CCTV cameras or security personnel on site who will be assisting you in securing the venue from intruders. Another advantage of personally visiting the venue is that you get to decide where you want your wedding gift table to be placed. It is advisable to keep the wedding gifts table close to the stage exit and not the venue exit. Make sure the table is big and wide, which makes it inaccessible for wedding crashers to flick your wedding gifts away. If you’re thinking of setting a candy bar table, place your wedding gift table right next to it or at a place that is visible to a larger audience. This is not to show off the bundle of presents you’re receiving, rather it is a great plan to make it absolutely impossible for any wedding theft to occur given that there will be many people in and around watching the gift table at all times throughout the event. A wedding crasher will definitely think twice before lifting something up. To double up the security for your wedding gifts, you can appoint one or more reliable gift-attendants from amongst your family and friends. This can be the couple's best friends, cousins or anyone from the bridal party that the couple fully trusts to take care of collecting, storing and transporting the wedding gifts. Saving up for your honeymoon?! By this we mean signing up for an online gift registry that offers your guests the convenience to deliver the presents straight to your home. Another way of safeguarding your wedding gifts is to sign up for wedding insurance, that will cover your damages.